If you need to add a sweet element, but the temperature required does not facilitate the melting of raw sugar, simple syrup is the way to go! Like most Greeks desserts, simple syrup is applied to a large variety of sweets like baklava and galactoboureko. 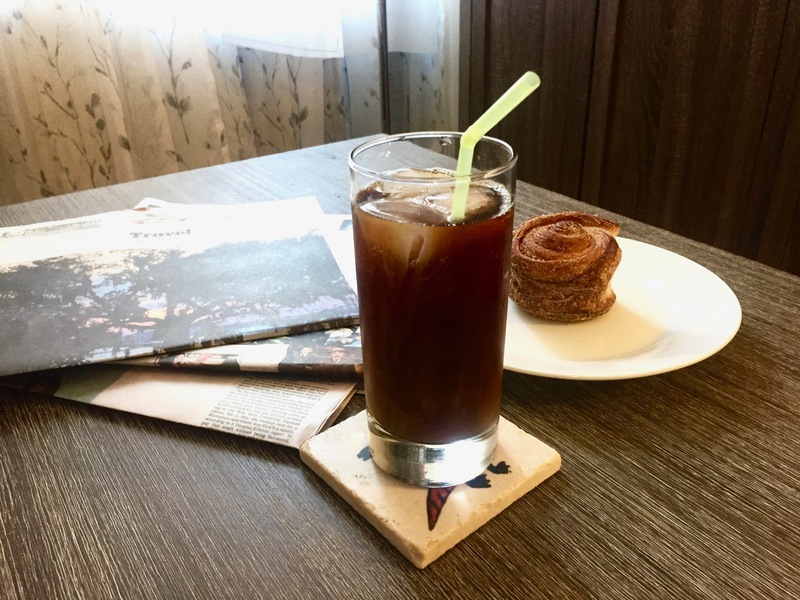 In America, simple syrup is the common sweetener for iced tea and coffee. Simple syrup is also on of the best ingredients for cocktails. 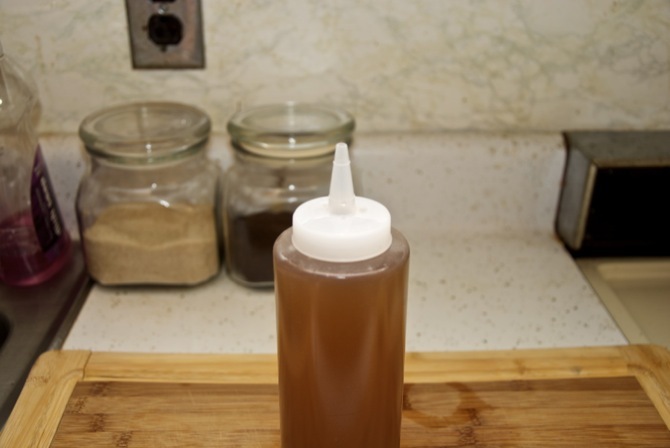 Syrup brighten ups the flavors and take the sharpness of harsh liquor. Plus making simple syrup gives us the opportunity to dive into the relationship between sucrose concentration, boiling and freezing point. As the name implies, it is simple to make. 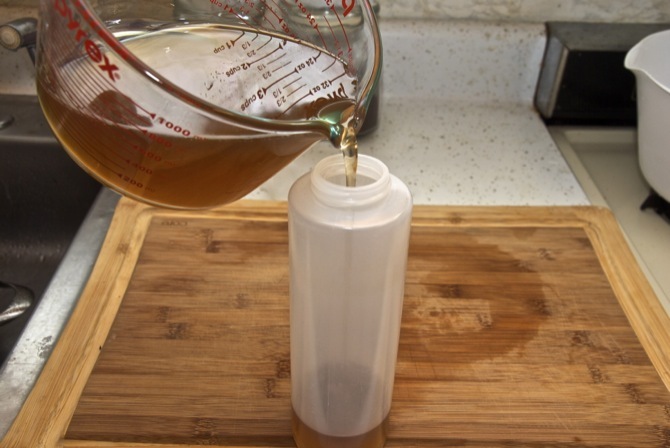 It relies on some simple physics and chemistry concepts that, once you master, you will be the expert on simple syrup! 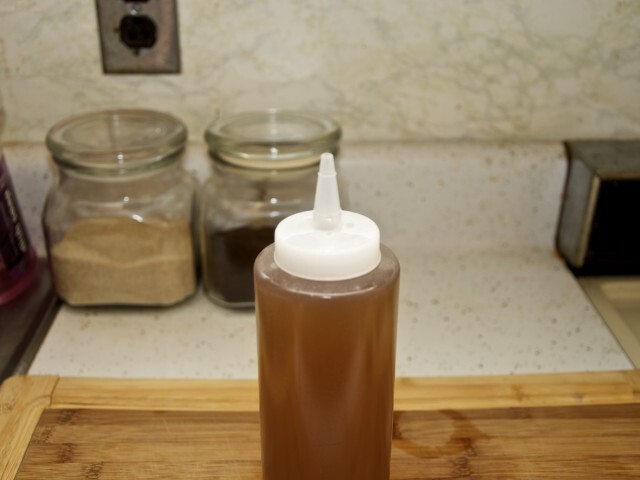 The perfect simple syrup must deliver the sweetness without diluting too much the cocktail, tea or coffee. It should also create some substance to the mouth and develop a rich taste. 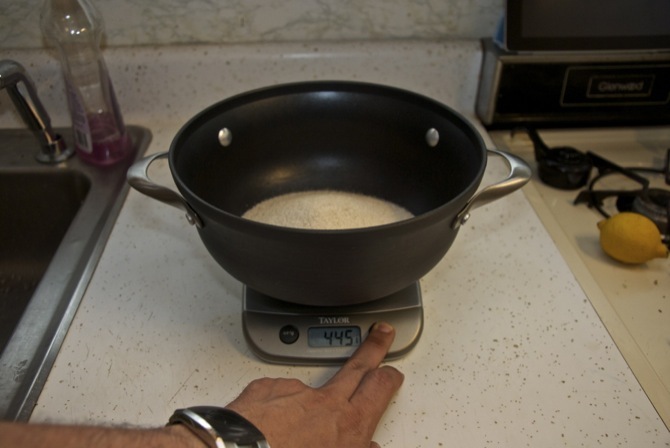 To do that simple syrup, we need to create the perfect proportion of sugar and water. The average home probably doesn’t have a refractometer or a diachronic polarizer, so we shall rely on simple chemistry and physics. Pure liquids have two basic properties; freezing point and boiling point. 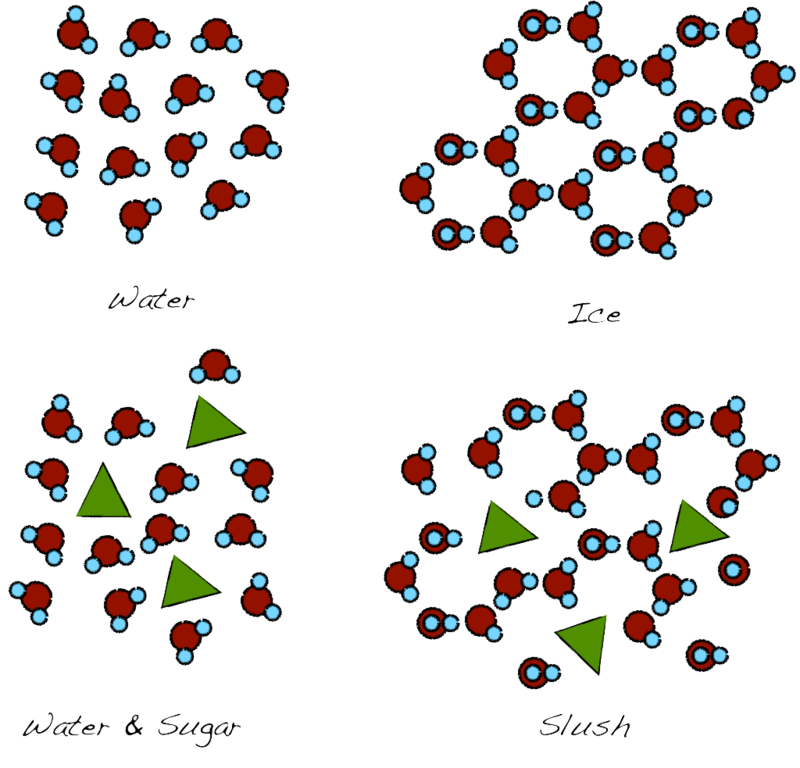 Both correspond to a phase transformation: solid (ice in the case of water) and gas (steam for water). 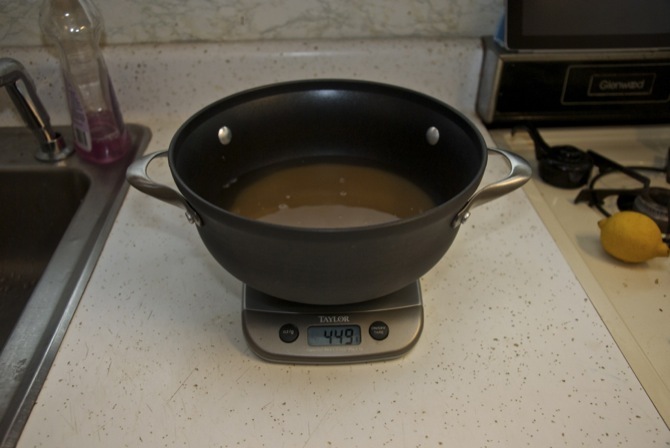 Water freezes at 0 ºC (32 F) and boils at 100 ºC (212 F), right? Yes and no. This applies to pure water (at the level of the sea). When you add any other molecules, things change. Freezing is the alignment of the water molecules form a repeated structure called a crystal. When other molecules get into the mix, that process is disturbed, requiring further lowering of the temperature to achieve it. In the case of water, it forms a slushy concoction which can be very refreshing in the summer. That is one of the reasons that “slushies” are softer than ice. It only partially freezes since it has water and sugar. Top: The randomly oriented water molecules align to form the ice crystal. 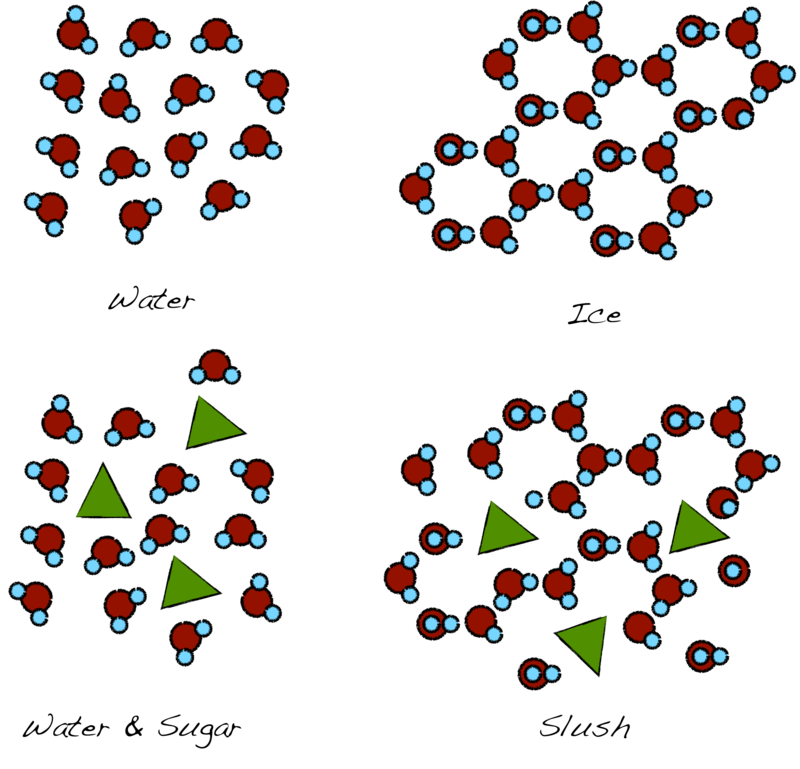 Bottom: When sugar or other molecules are present the process happens only partially as the presence of sugar molecules disrupts the structure of the ice. 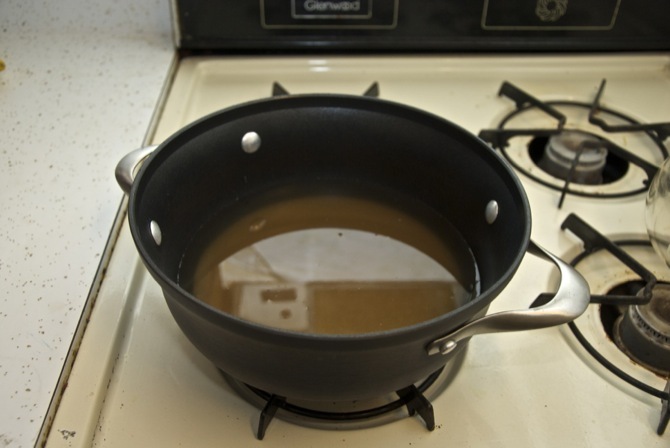 When a liquid is boiling, the molecules enter a gas phase through the exposed surface. 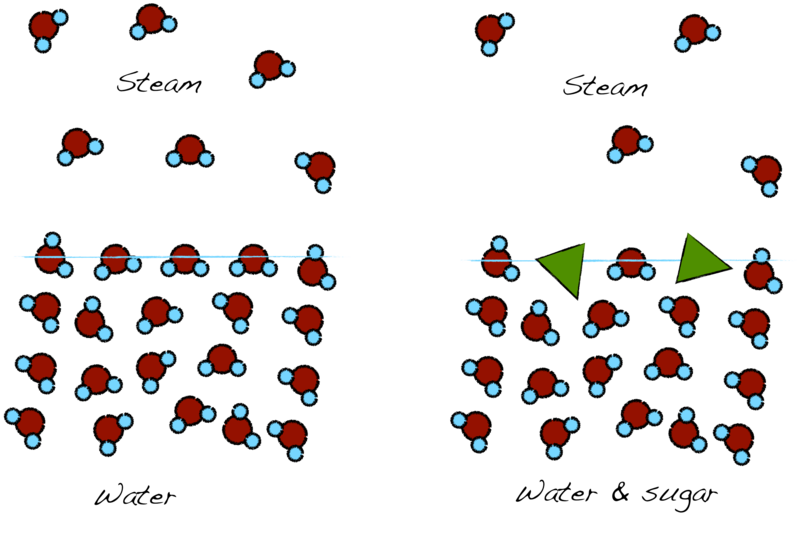 When there are other molecules in the mix, the available area for evaporation is reduced. We will need to further raise the heat to achieve evaporation and thus increasing the evaporation point. 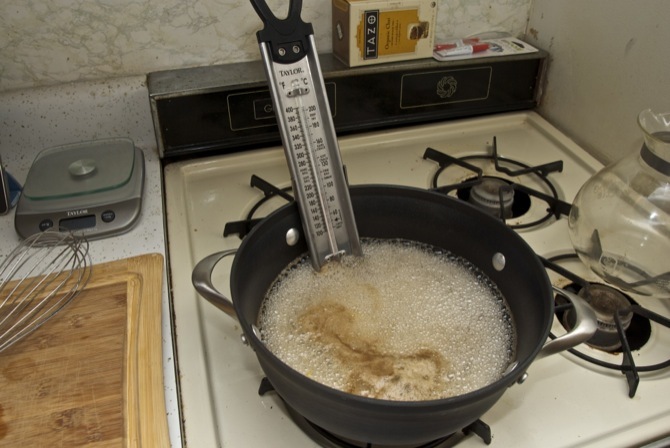 When we are making syrup, the sugar is expected to increase the boiling point of the water. 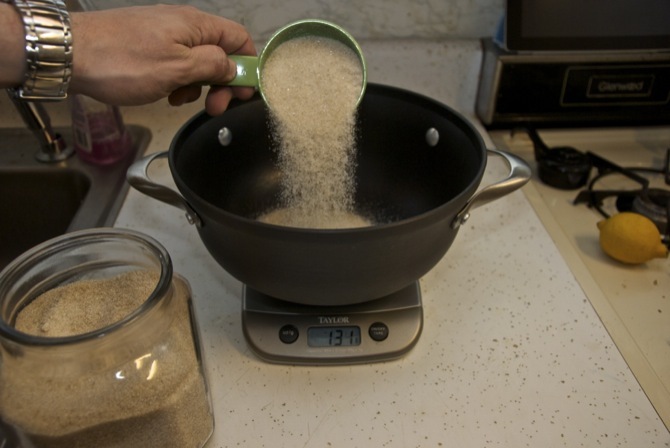 The more we boil, the more water evaporates, and therefore, the sugar concentration further increases, driving the boiling point higher, evaporating more water, increasing the sugar concentration etc. The presence of sugar (green triangle) reduces the available area for evaporation, reducing therefore the liquid to gas transformation. To compensate for that more heat is required thus increasing the boiling point. In both cases the rise of the boiling point or the depression of the freezing point depends on the water (or generally the solvent) the sugar (or generally the solute) and the concentration of the solute. As you can imagine, not infinite amount of sugar can dissolve in the water. There is a maximum concentration that beyond that the sugar will remain in the crystalline form. This concentration is called saturation point. At room temperature (21 ºC) this can be up to 66% by mass fraction (66 gr of sugar in 34 gr of water, roughly a ratio of 1:3 water to sugar) and at 100ºC this goes up to 82% mass fraction (82 gr of sugar in 18 gr of water, roughly a ratio of 1:5 water to sugar). Assuming now, that the saturation point of the sugar has not been reached yet, thermodynamics can help us calculate the change in the freezing and boiling point of the water with the addition of sugar. The temperature change is calculated by approximation and depends on the purity of the water and the purity of the sugar. To increase accuracy it is recommended to use gr and ml for the sugar and the water respectively. *Cup is not very accurate metric. 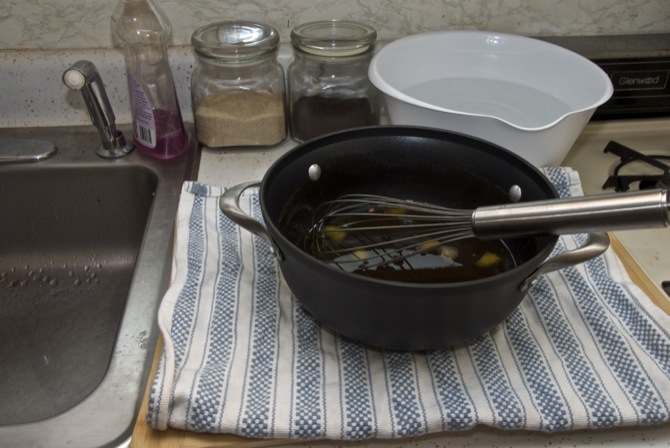 However, during the boiling of the syrup a portion of the water is evaporating raising further the sucrose concentration and therefore the boiling point, while lowering the freezing point. It is a cycle that results in a linear relationship between temperature and sugar concentration. If we know the temperature, we know the sugar concentration and indirectly the freezing point. However, there is a lot more to it. 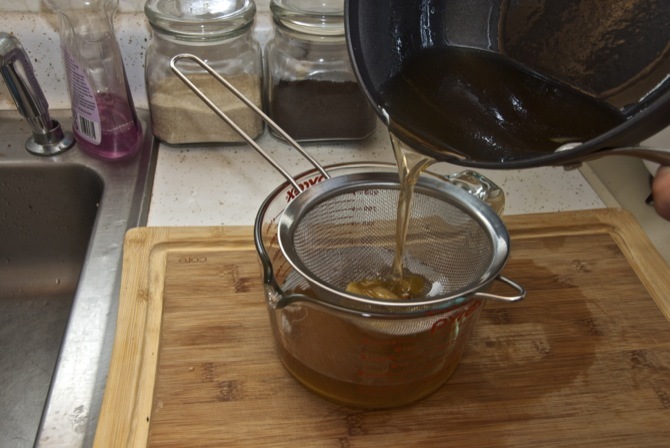 At around 186 ºC the sugar burns so no equation is valid anymore and the use for this syrup is compost. But even before that things start getting interesting. You see sugar as we said is a disaccharide composed of fructose and glucose. In the present of acid and at 114 ºC the disaccharide breaks and creates a fructose and a glucose molecule. This reaction is however extremely slow so it usually it does not take place. It can be accelerated with the presence of acid, very little acid in the order of 1% by weight. This solution is called inverted-sugar and is a very good thing in deed. Glucose is less tweet than sucrose (60% less sweet), while fructose is more sweet than sucrose (20% more sweet). So equal ratio of glucose to fructose is less sweet than the original sucrose solution. But wait there is more! If we keep the temperature at that neighborhood, one more reaction takes place and glucose is hydrolyzed to fructose starting to turn the ratio to the favor of fructose resulting eventually to a solution that is more sweet. 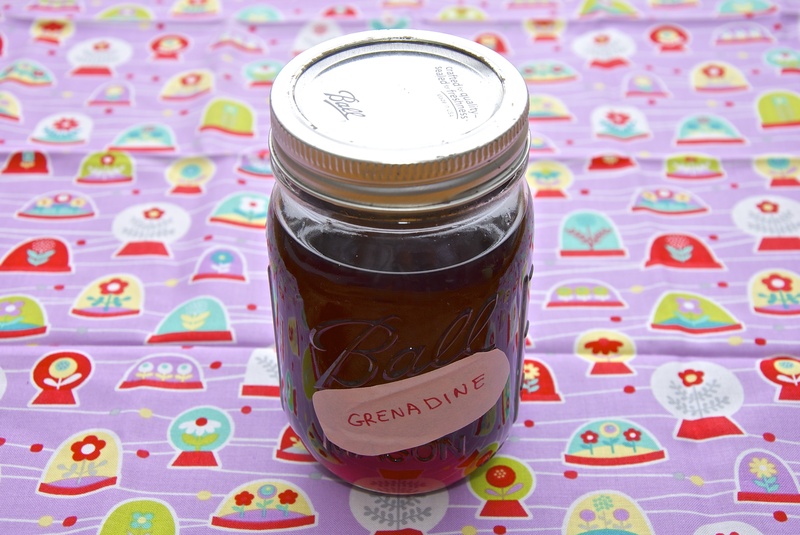 Since glucose and fructose picture is sweeter than the simple syrup and it is a concoction that has many culinary uses. 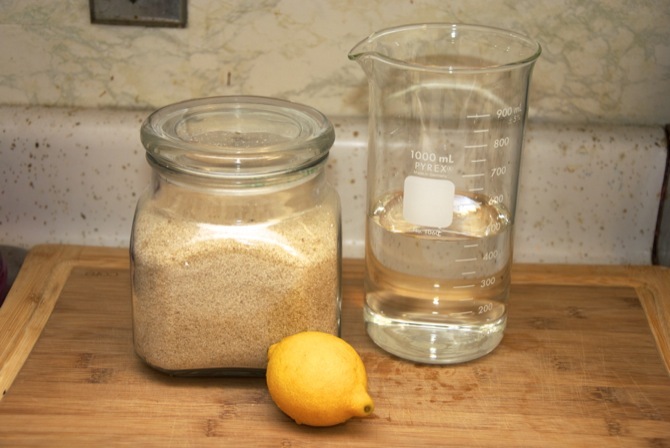 It is however, highly viscous, but since the breaking of the sucrose and the hydrolization of the glucose are irreversible reactions it can be diluted down with water to the appropriate consistency. *Taking into consideration the hydrolization of the sugar at 114 ºC. Here we will not exceed this point we will stay below the 114 ºC and since it makes things simpler to talk directly to temperature rather than concentration, we will reference from now on to boiling point. 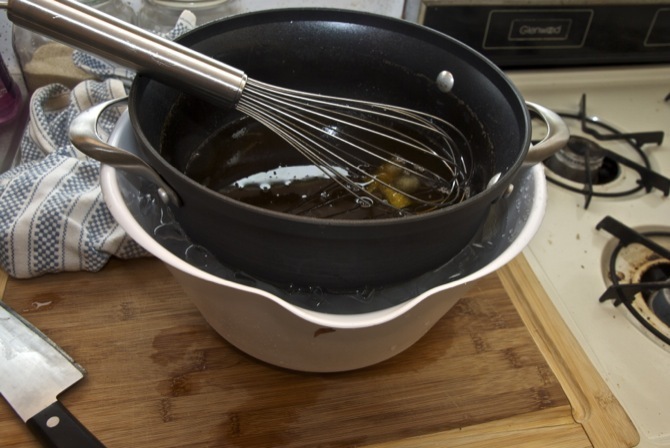 For the simple syrup, the temperature we should focus on is 105 ºC or 221 F. This will result in the syrup to achieve a nice consistency, darkened color and, because the intense heat will break some of the sucrose to glucose, slightly sweeter than sugar. As expected, there is sugar and water. 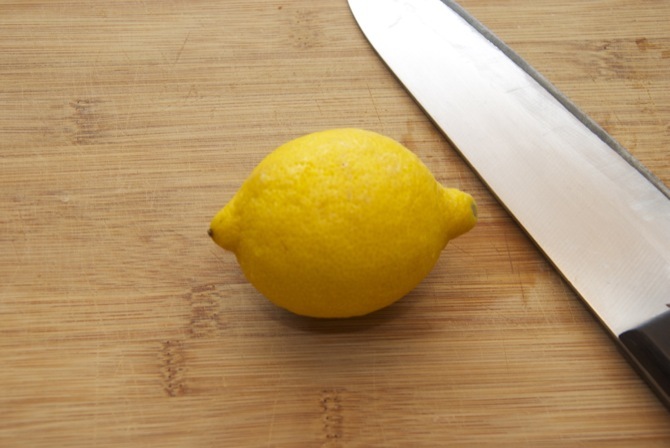 The lemon is there to give the mixture something “extra”. A sour flavor to tease the tastebuds, if you will. 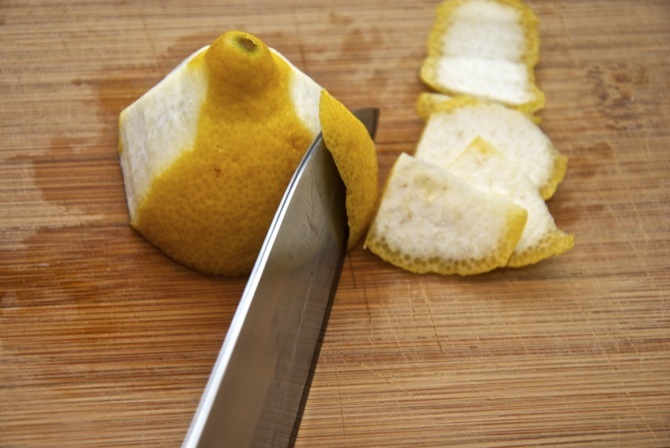 Moreover, the peel has pectin, a molecule that when it mingles with water in acidic environment, it thickens. That is the secret behind jellies and jams. I didn’t specify amounts because you can make as much as you want. The secret is an equal amount of sugar and water. I know what you are thinking: “I will add more sugar so I don’t have to wait for very long” or “I can add more water just to be sure”. Both statements are wrong. 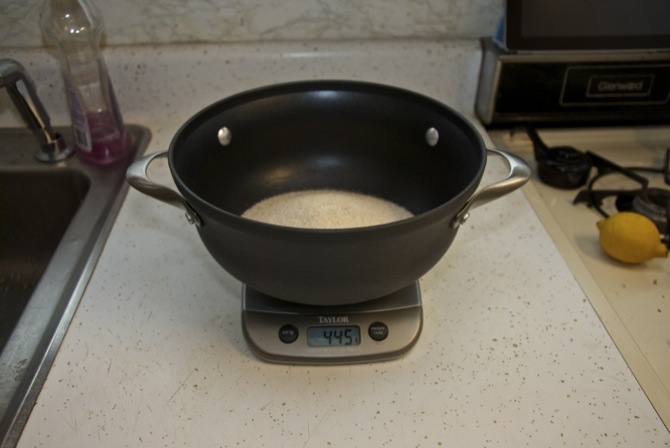 Adding more sugar will immediately raise the boiling temperature and by the time you see evaporating bubbles, the 105°C point will be much gone. 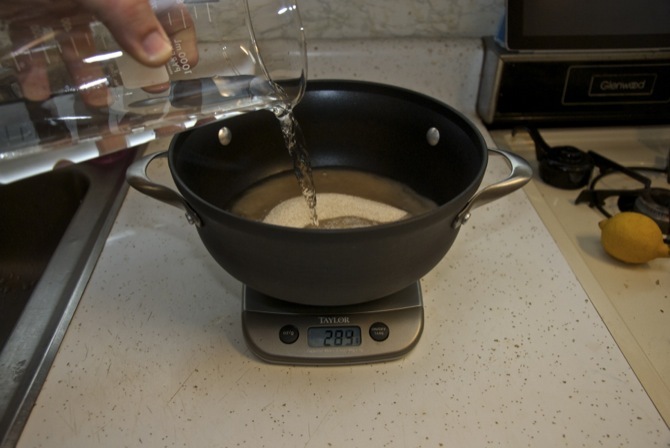 In fact the ratio 1 water : 2 sugar will raise the boiling point at 112 °C. Much higher than what you need. 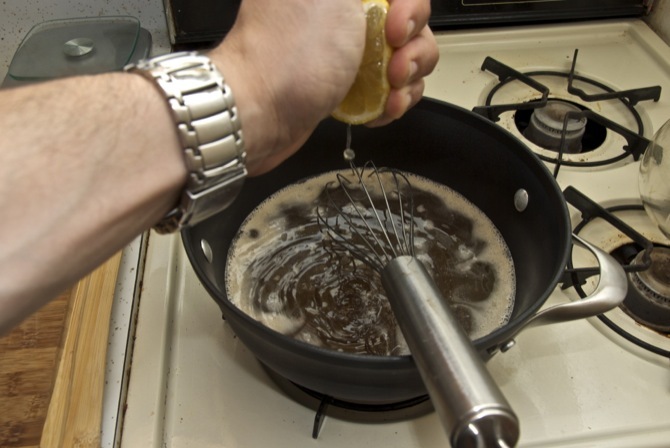 On the other hand, adding more water will delay the process, exposing the sugar for much longer to the the harsh heat. That will further darken the color and will develop a caramel color. 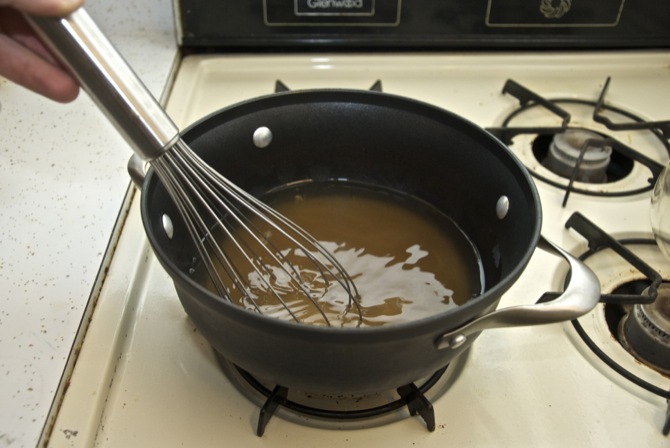 Not that there is anything wrong with a thicker syrup or a caramel color, but it will throw off your recipe. 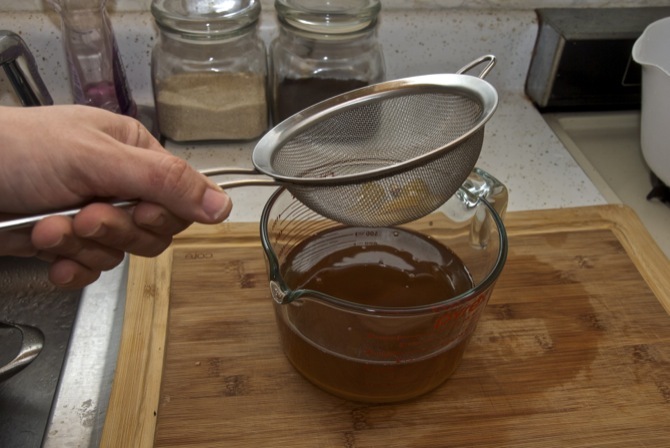 Remember: a thicker syrup will be harder to dissolve. 455 gr. 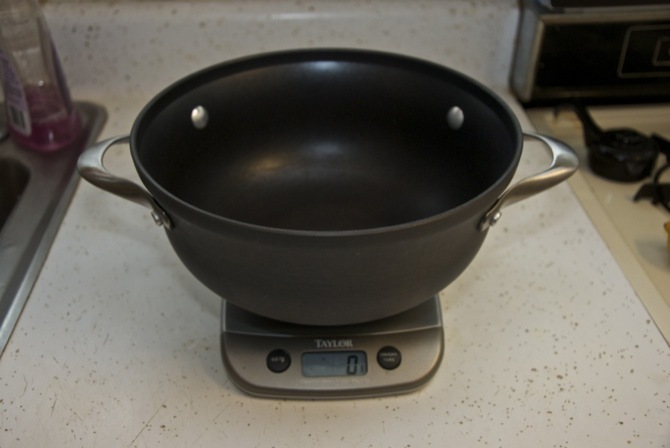 Se we need to add the same amount, by weight of water. And pour in the water. Bring it to the stove. Mix it and let it boil. Squeeze the juice in the syrup. This is just for flavor since we will not go over the 105 ºC mark. Through that in and let the boiling continue. Of course you need a thermometer. 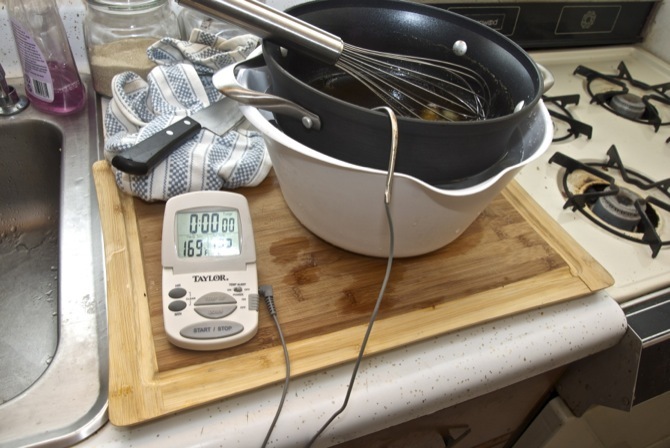 I use a candy/fry thermometer. The old days the whole temperature thing was unknown so they used to refer to the proper temperature based on the way the syrup behaves when thrown in the cold water. 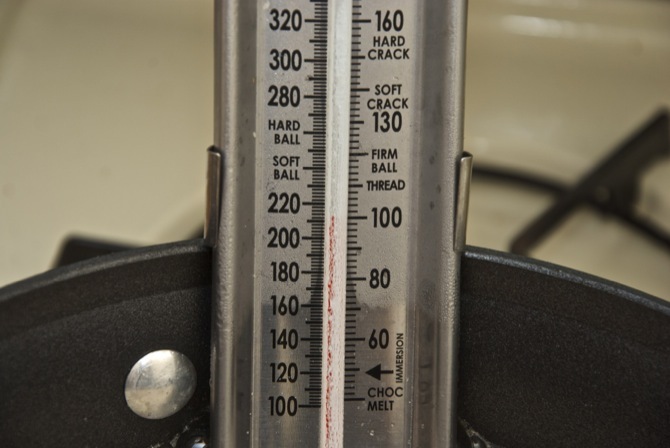 That ‘s what you see on the thermometer as hard crack, soft crack, firm ball etc. We don’t need that. We know the theory now. Also as you notice there is a lot of crap floating. That is because I used Demerara sugar that is in a more raw stage than the refined. It is not healthier since by a 99.9% is the same as the regular white sugar. I like it better though because it give a deeper molasses flavor that is complex and unique. The boiling starts at 100 ºC. Until it gets to 105 C. We are done! According to the equation above we have dropped the amount of water down to 136 ml from the 449 ml initially. 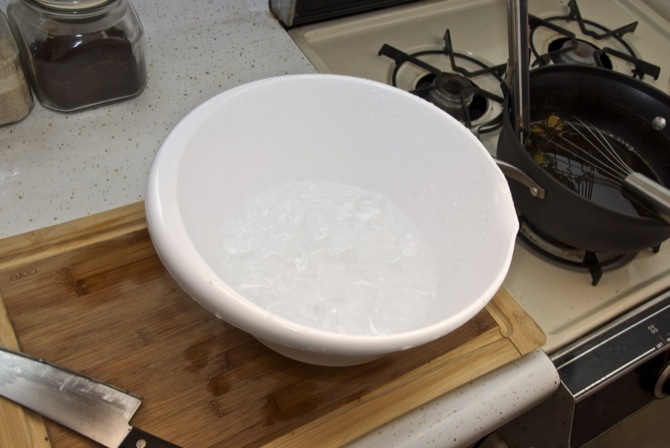 Get a wide bowl with iced water. Put the pot in the bowl of ice to cool the syrup. 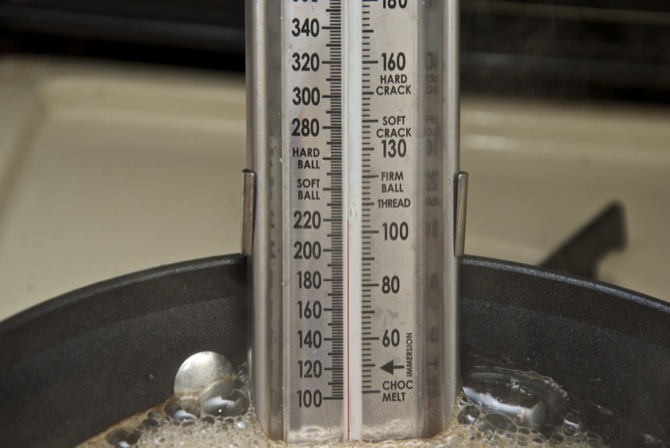 Sugar syrup can get to very high temperatures, even if we yielded at 105C. Since the syrup is very dense, it can cause serious burns. They don’t call it culinary napalm for nothing! 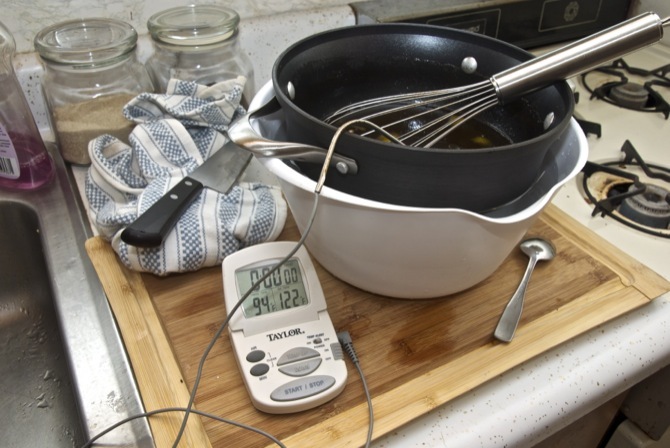 I set up a rig with my meat thermometer and when it the temperature falls below 100 F (37 C) I will handle it. 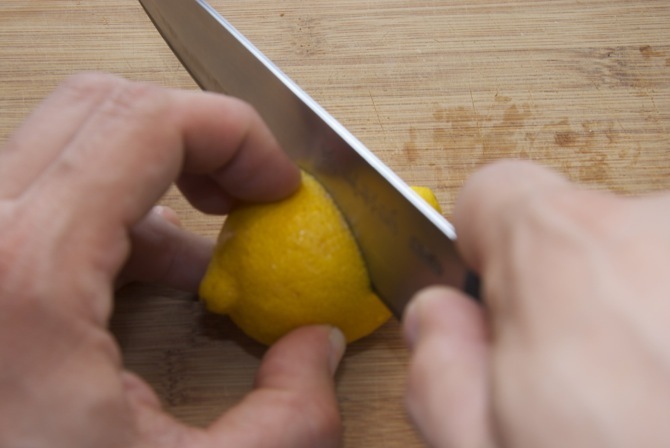 And pass it through a strainer to get the lemon seeds and peels. Now you can store it for your favorite applications. I put it a squeeze bottle to make handling easy. There you have it! 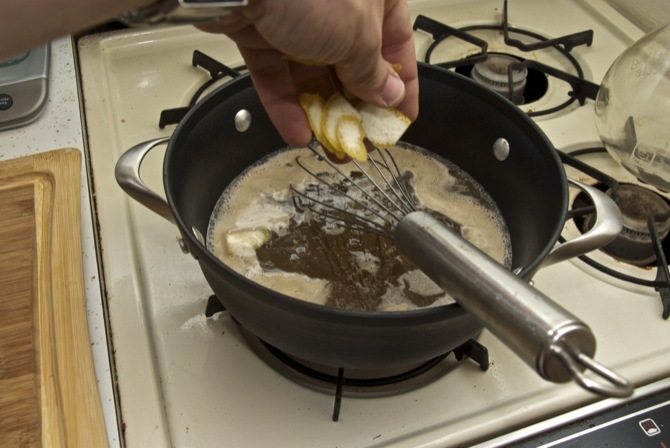 You can use this procedure to make flavored syrups. 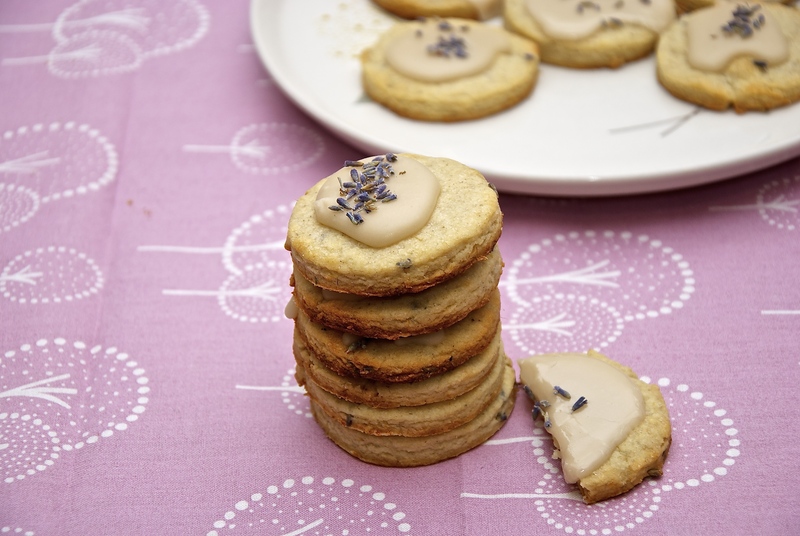 Vanilla, rosemary, citrus… You can also use darker sugar or whiter or even a mixture. Anything that you like… sky is the limit! 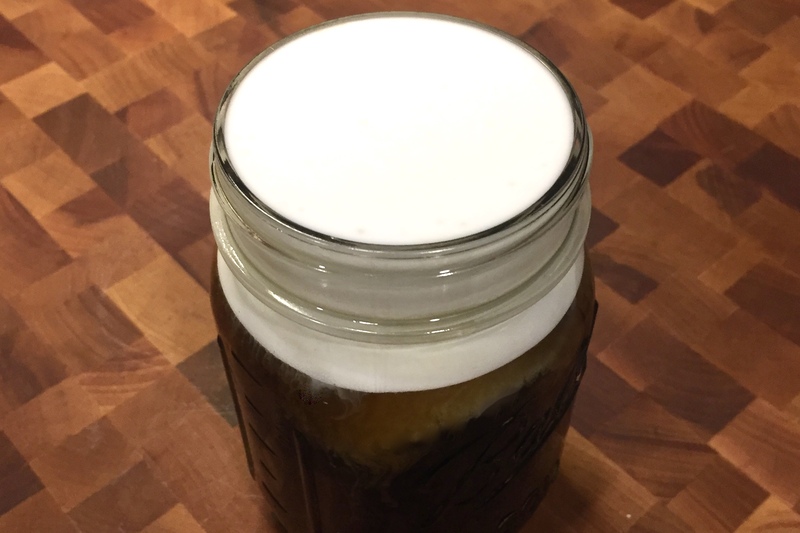 Sugar syrup is a great addition to any cold beverage and an essential part of cocktail. Making it, however is not as simple as it sounds. In a pot mix the water and the sugar. Bring to boil and add a thermometer. Watch until the temperature reaches 105 C (221F). Remove and let cool down to 30 C (86F). 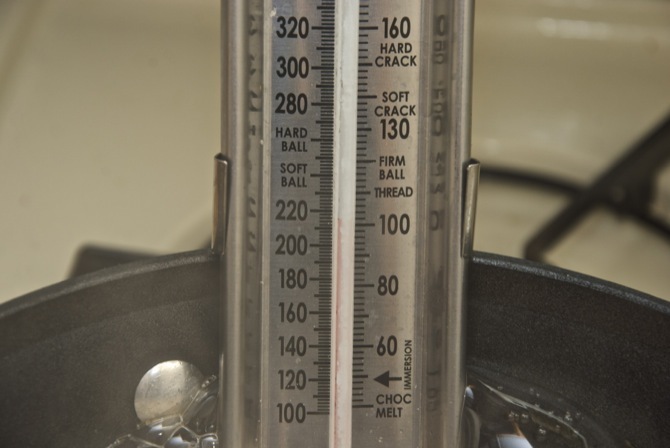 Use a candy thermometer for best results. You have one awesome blog! Very interesting explanation of chemistry behind the recipe. What equation? (Search for “equation” and you’ll see).